Dealing with a plenty of content day by day, being able to understand the need for CMS in business. There are many businesses that fail to understand the very thing and its importance. To all those businesses I would like to dedicate this post. Every business must rely on CMS system to build their potential. Now let us proceed in understanding the need for Content Management System. What are the characteristics of a CMS that improves the business? The CMS which you select should meet your business needs. You could find a difference in selecting the best CMS platforms that could help in a better way. As the WordPress platform gives you an “Easy to use” Experience you could use it as your priority. In case if you are looking out to manage your website with many properties then you can choose Joomla or Drupal. Make sure that you are selecting the right one to improve your business potential. While choosing you should be good enough to estimate whether your choice fits your budget. Because the budget is the root cause, to begin with any process. A perfect CMS is always the one that can fit into any budget and fulfills the need at an affordable price. WordPress vs. Joomla vs. Drupal: Which CMS is best for a business website? On selecting the right CMS your are finding right solutions for integration. Especially, online storefronts need scalable hosting options to avoid crashing during the high-traffic. Though you may not use an online store website, yet it is important that you choose the best CMS that is compatible. Further, follows with content architecture. But until you map your website you cannot understand the integrations needed. At the same time determining the expected traffic fluctuations is essential. By this, you would make it up with the right CMS that meets the hosting needs. Many business personalities fail to secure their details of their websites. Though you may have developed a stunning website, but failed to secure it, then it is useless. In case if you are selecting a CMS, then you should be definite in selecting the one that is secure enough. To your notice, open source platforms are not that secure. However, you are supposed to make your system secure enough according to your needs. Along with it ensure that the CMS which you choose is provided with the required certificates. Planning it to be so or how secure it has to be, you could save your website from future disabilities. Still, there are CMS that are efficient enough to handle yet they fail to meet the requirements. You shouldn’t be selecting one such. The efficient way of selecting the best CMS is by looking at its features. This proceeds with the purpose of your website and the project map. Your perspective should make your website deliver the best use cases and determine the features that are appropriate. Which in turn makes it meet the future use cases. You should never choose the one that is capable to meet the current scenario. Rather, go with the one that meets even the future priorities. The best CMS would be the more flexible one. As flexibility is the key note in selecting the content management system. The possibility of developing custom pages and default templates are the biggest benefits of choosing the right CMS. The design is the core element that carries trust among users. It is good to ensure that the site and the pages are flexible enough. There is no constraint in choosing your best designs and themes. At most cases, I have come across businesses that are in need of handling websites with high efficient tools. And that is where plugins play an important role. You should be clear enough in choosing the right CMS that provides the necessary plugins which are necessary for your business development. The effectiveness of website depends more or less on the personalization. A CMS that helps with user effective personalization scores a more trust when compared to any other CMS that does not provide them. A best CMS system is the one that has the above-mentioned characteristics. You could find a system that is highly specific in meeting the needs of your business. 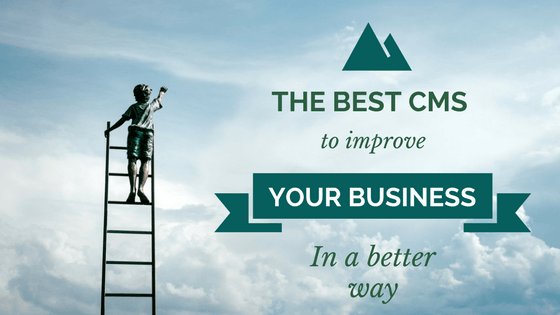 Make sure that you are selecting such a CMS to improve your business in a better way. If you are planning to develop your business and if that is going to be through your business website then you should definitely look out for the above-stated characteristics. As this is going to be a step that you take for a long run. And it should be a one that marks the business at the highest standards. This is surely going to help you a lot. Let us know on your successful step.